This is due to Comcast killing off personal web space. I've also given the docs to Synthcube and Thonk just in case. If at some point I get more time on my hands again, I'll set up some hosting, and put these up properly again. I just wanted to make sure they were available again in the meantime. Now that things are moving again, I will get a wiring diagram together for this one first, as it's more complex than the others. I'll start it ASAP. Is there a functional description of this module anywhere? Obviously it's some kind of VCO, but a description of the 'fade' part would be useful. One part is a VC Crossfader / Panner. 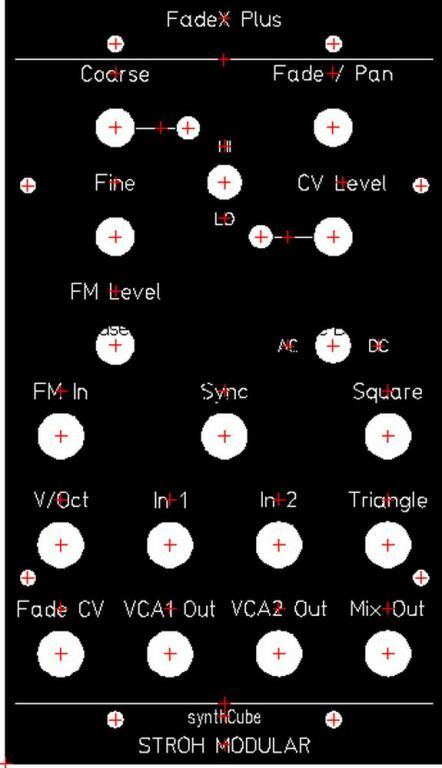 So you could do things like automate a crossfade of two signals using the included VCO, or you could use the cross fader to take the triangle and square waves from the VCO, and VC crossfade the shape (similar to a Buchla 258 or the like). The oscillator has excellent Volt per Octave tracking, linear FM, full reset sync that you can hold indefinitely. The AC/DC switch is for the coupling on the fader inputs. You could make some fairly complex modulations in LFO mode for example using DC coupling. That's more or less the idea. One part is a Triangle Core VCO (with sync, FM, etc. Aside from the fine-tune pot here, is this VCO the same as your PicoVCO? The main VCO board is nearly identical. The main difference is the shape of the PCB. But no documentation. Aside from the connection diagram, there seems to be nothing. Schematic would be helpful. The synth cube built docs have a link to THIS page! On the vco core pcb There is an eight pin smt pattern under q101/q102. No ref des or any markings. Do we just ignore this? I apologize, I had an annotated version of the BOM. I will see if I can find that, or I will update the current one. There are no changes necessary, just additional notes about things like this. One more note as this may come up. The caps labeled BP are just 100nF bypass and bulk caps.